PEANUT BUTTER FUDGE NOW ON VIDEO! Enjoy this delicious Peanut Butter Fudge! 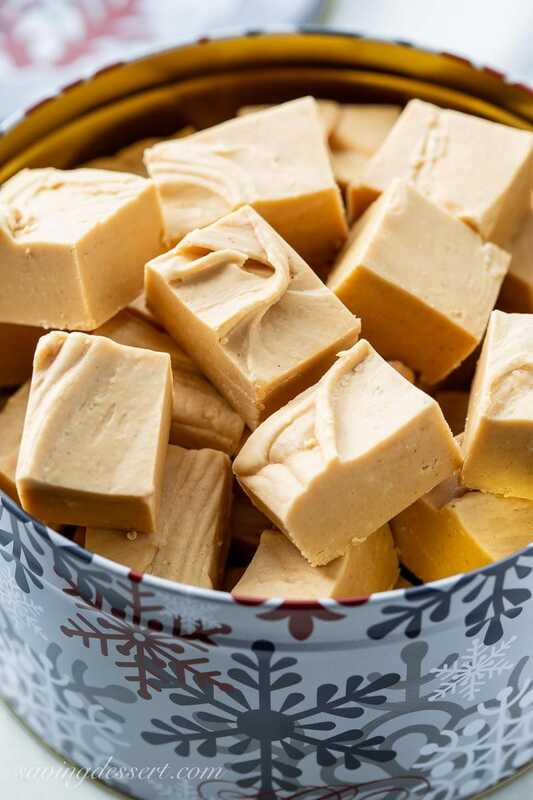 Smooth and creamy, sweet and marshmallowy, this fudge is a delicious holiday treat great for gifting, sharing, and shipping to your loved ones. Peanut Butter Fudge is the most requested candy I’ve ever made. Men, in particular, love it. Maybe it’s the peanut butter, maybe it’s because it’s so sweet and creamy! I created this recipe by adapting the original chocolate Fantasy Fudge RECIPE on the back of the Jet-puffed Marshmallow Cream jar many, many years ago. Everybody loves it! After making this fudge 400-gazillion times, I’m pretty sure I have the perfect recipe for success. Use an instant read thermometer (like the one featured below) or a regular candy thermometer. Boil the sugar mixture to 240F then remove from the heat. This is a little higher temperature than you might cook regular fudge, but it’s necessary as we add creamy peanut butter to the mix. You want the fudge to be creamy and soft, but not squishy. In the video featured above, I was cooking on an induction hot plate which I turned off once the mixture reached 240F. This kind of cooktop cools quickly but normally I remove the pan from the heat when using my regular stove top. 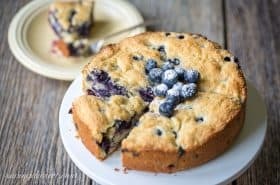 Be sure to have all your ingredients measured out and ready to go as this recipe moves fast once the butter sugar mixture reached 240F. Vary your craft by sprinkling light salted peanuts on top of the hot fudge, or stir in 1 cup of peanuts just before pouring into the prepared pan for a chunky fudge experience. For the chocolate peanut butter lovers among us, divide the mixture between two 8-inch or 9-inch baking pans. Next, make a batch of chocolate Easy Fantasy Fudge (skip the pecans) and divide between the two pans of peanut butter fudge. Instant layered fudge – and the best of both worlds! Use regular creamy peanut butter like Jiff or Peter Pan. Natural peanut butters don’t work well in this recipe. It may sound weird but I prefer using margarine instead of butter for this recipe. I never bake with margarine anymore, but for fudge and our English Toffee it just works best. If you can find it, Parkay is my favorite brand of margarine for candy making. This recipe is easily doubled then poured into a 9×13-inch baking pan. For shipping or gifting leave the fudge in one large piece, or several bigger pieces tightly wrapped in plastic wrap and a ziplock bag. The lucky recipient can slice when ready to serve and there’s less chance for the fudge to dry out. This also helps with longer storage of the fudge at home. You can freeze fudge! Wrap tightly in plastic wrap, seal in a ziplock bag and store in an airtight container for up to a month. For longer shipping times, freeze before mailing. Let’s be baking friends! When you try our recipe please feel free to leave a comment on this post. I’m sure your experience and insights will help all our readers, and it helps me too. Also, if you’re on Pinterest feel free to leave a comment and photo there if you have one! If you share on INSTAGRAM tag @savingroomfordessert so we can stop by and give your post some love. And we’d be very happy if you’d FOLLOW Saving Room for Dessert on FACEBOOK| INSTAGRAM| PINTEREST | TWITTER and subscribe to our YOUTUBE channel for all the latest recipes, videos and updates. Thank you!!! Pick up a Digital Instant Read Thermometer for all your cooking needs. Great for meats, grilling, candy making, deep fried foods and even bread! Take the guesswork out of your recipes and get crucial temperature results in 4-7 seconds. This thermometer is very affordable but not 100% waterproof. Check all the models and find one that fits your needs and price point. Easy to clean and store! 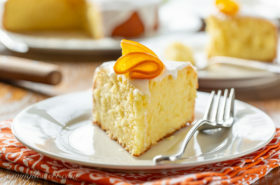 *Saving Room for Dessert is a participant in the Amazon Services LLC Associates Program ~ I earn a small commission, at no additional cost to you, which I use to pay for web hosting and services for this blog. Thanks for supporting SRFD! The most requested Christmas treat - year after year! Mix margarine, sugar and milk in a heavy 3-quart saucepan; bring to a full rolling boil on medium heat, stirring constantly. Continue boiling 5 minutes on medium heat or until candy thermometer reaches 240F degrees, stirring constantly to prevent scorching. Remove from heat. Gradually stir in the peanut butter chips until melted. Add the marshmallow cream and vanilla. Stir until smooth and blended. Pour into prepared pan and cool at room temperature. Do not substitute sweetened condensed milk for the evaporated milk. See TIPS in the original post for more ideas and tips for success. 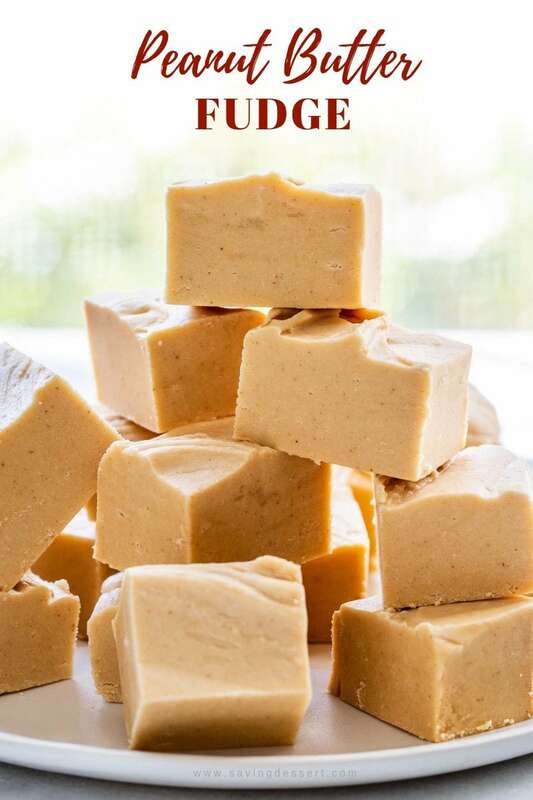 I make a similar peanut butter fudge recipe but I use all brown sugar and just a cup of peanut butter, no chips. It tastes amazing! It’s very soft though so I pour it into individual containers and give it as gifts with a small plastic spoon for eating. People always request more. That sounds great Debbie – thanks for sharing your version. Love the idea of individual gifts with a spoon. Very thoughtful! I personally don’t have one but here’s a recipe you might like to try – https://www.allrecipes.com/recipe/91737/eagle-brand-peanut-butter-fudge/ Good luck! I’m excited for you to try this recipe! I hope you enjoy this delicious fudge. Thanks for giving it a try! Hi, looks amazing! 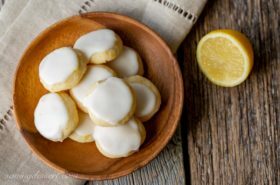 I want to make these but I’m in the UK and can’t get a hold of peanut butter chips- if I replace with normal peanut butter, will it be too dry? Any suggestions? Thanks! Hi Janine. So sorry you can’t get peanut butter chips. You may try white chocolate chips if you can get them. You need some sort of chocolate to help bind it together. Good luck and have a wonderful holiday season! I made some this morning and it is a little crumbly and dry. What did I do wrong. I thought I followed your recipe exactly. Any suggestions? Thanks. Hi Marsha – so sorry it turned out dry. Did you use a thermometer? You can’t cook it past 240F or it will be too dry. Also, did you remove it from the heat after it reached soft ball stage? You have to stop the cooking pretty fast, add the peanut butter, chips, marshmallow creme, etc. before it has a chance to set up. Hope you’ll try again and I bet it is still delicious! I am absolutely going to try again. In fact I am getting ready to go get a thermometer because I didn’t use one! It was delicious, but not appropriate for gifts. Thanks for help. I purchased a thermometer and my fudge was perfect!! Now I am curious about the fantasy fudge recipe…you said you never use a thermometer when making it. Am I to understand that I should boil it for 5 minutes, check for a soft boil stage or should I try the thermometer with it also. Thanks again so very much! Hey Marsha! That recipe was one of the first I ever posted on this blog – more than 8 years ago 🙂 I didn’t have a thermometer back then, but of course I moved into the world of perfect fudge each and every time, with a thermometer. You’ll want to cook that chocolate fudge to a little lower temperature. Soft ball stage is 235F to 240F. I prefer the chocolate fudge somewhere in between – maybe 238F. I cook the peanut butter fudge to 240F because with the addition of peanut butter, it needs the extra cooking time. Hope that all makes sense but if not, please get in touch again. So glad it turned out for you!!! Peanut butter fudge is the best! Mrs KR makes it in the microwave — doesn’t get as creamy as the traditional method for making it, however, which is a consideration. Peanut butter and chocolate also makes an excellent fudge. 🙂 Anyway, this looks wonderful — super recipe. Great pictures, too. Thanks! Thanks John! Welcome back 🙂 Hope you had a fantastic trip! My husband would really like this fudge because he practically lives on peanut butter. It’s a great idea for gifts. Thanks Gerlinde – men really love this fudge, and I bet your husband would too! I think I have a few homes for this! What a winner! The FIL will be pleased! Looks perfect Tricia. My tastes changed as I got older but this was my favorite as a kid. 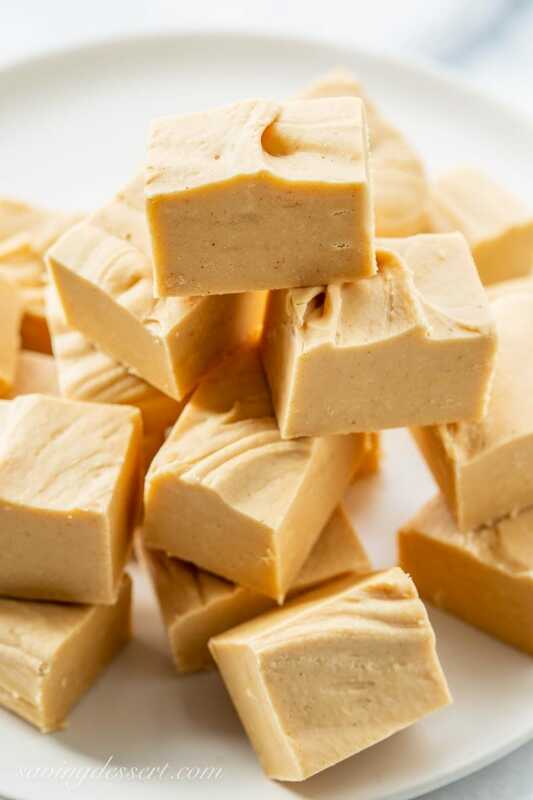 I’ve made this fudge so many times over the years, I think I could do it in my sleep! 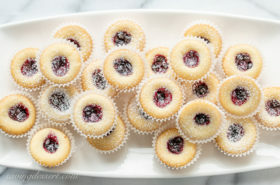 Hope you give it a try Jennifer – always delicious and a favorite on the dessert tray. My hubby is a huge fan of peanut butter too 😉 They look melt-in-you-mouth delicious! This looks so creamy and tempting. I am thinking that for Christmas I could make two kinds of fudge: your Peanutbuuter and then adapt your wonderful recipe to Caramel Pecan Fudge. I’d use Ghirardelli Caramel Chips instead of the Peanutbutter Chips and Barney Almond Butter instead of the Peanutbutter. (Barney Butter is very creamy and homogenous as opposed to natural almond butter where the oil would separate.) I would add Toasted Pecans, like the Candied Pecans from Trader Joe’s. Sounds terrific Beverly! Happy holiday baking and thanks for stopping by! It’s been a very long time since I enjoyed Peanut Butter Fudge. The mother of a friend in high school made it and, I’d make sure I went for a visit during Christmas when I knew Mrs Rallinson would make it. She only made the chocolate but, I’m eager to try to 2-tone. Thanks for posting this; I never thought I’d find it again. Do you have a recipe for DATE NUT BALLS? I think I’ve lost the copy my mother gave me and she died in 2002. I recall it uses dates, Rice Krispies, pecans and a sugary mix so you can roll them up into balls then roll in powdered sugar; no baking required. I asked my family which sweets they wanted me to make for Christmas and the DATE NUT BALLS was the only one they mentioned. Naturally, it’s the one recipe I can’t find! Thanks for your help!! Thanks so much Bobbie. I don’t have a recipe for Date Nut Balls but found one on the Rice Krispy website. Maybe this is the one you’re looking for? Here’s a link – DATE NUT BALLS I lost a bunch of my mom’s recipes years ago in a recycling accident 🙁 I was devastated. Happy holidays to you and thanks so very much for your comment. Enjoy!! I wish I could share it with you Angie – thanks so much! This looks creamy, decadent and totally irresistible! Peanut butter fudge is my FAVORITE too! 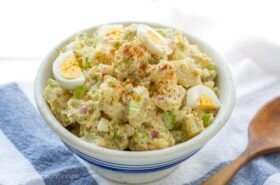 My Nana (great-grandmother) use to make this. Please tell me if you can, why do so many people put marshmallow fluff (creme) in fudge now? What was wrong with the old fashioned way? <br /><br />Thank you for your time and consideration you have taken with your blog! Happy 4th of July!! 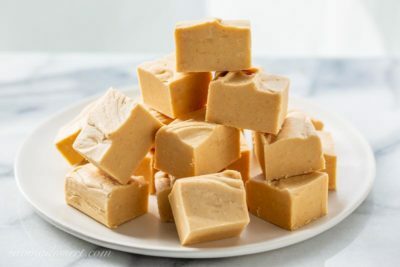 Peanut butter fudge is my FAVORITE!<br /><br />I used to make one that I put M&Ms in…this might be the closest to that recipe I have found.<br /><br />Bookmarking immediately.